We left the meeting room of the Highland Park Distillery and started our tour of the maltings. I'd forgotten my camera, however it gave me the opportunity to make notes and think a bit about the archaeological evidence for making malt. This was not my first tour of a malting facility. Years ago, when I started my post graduate research into the archaeology of malt, ale and beer I contacted Thomas Fawcett and Sons, Maltsters, in Castleford, West Yorkshire and asked if they could show us round. They were very helpful and friendly. Soon we had been given a personally guided tour of the maltings by James Fawcett himself. Fawcett's make malt for the brewing industry using traditional floor malting techniques as well as having modern Germinating Kilning Vessels. There's a short film on their website where the ancient craft of floor malting can be seen. We'd wanted to see how an industrial maltings worked, having already visited an 18th Century grain barn at the Corrigall Farm Museum, Orkney, with a threshing floor, malting floor and grain drying kiln. Making malt is the same process, whether you are in a grain barn on a farm or at an industrial floor malting. The only difference is the scale of the task. The tour of the Highland Park Maltings began with the steep tanks. Barley is steeped in water with regular air rests. Air is bubbled through. Steep tanks vary in size, obviously, but the basic principle is to get the barley wet enough and aerated sufficiently to trigger the germination process. Steep tanks emulate a traditional and probably ancient technique. Maltsters in history and prehistory would have put their harvested grain into a porous bag and then left it in a shallow bubbling stream for a few days. This practice would, of course, leave absolutely no archaeological evidence. I was first told about it by an Orcadian farmer, maltster, brewer and crofter, Harry Flett, who was the custodian of the Corrigall Farm Museum. In Britain, people began to grow barley and wheat around six thousand years ago. This was the neolithic era, when hunter gatherers settled down and grew crops. What were they doing with the grain? How were they processing it? The consensus of opinion in academic archaeological literature and belief is that, since the earliest neolithic, they were grinding it into flour to make bread. Perhaps they were boiling it up to make porridge or gruel. The possibility of making malt has not been taken seriously. Many archaeologists, including professors, have shouted at me when I've made this suggestion at conferences. They don't like the idea of making malt in the neolithic. I've written about some aspects of my research into neolithic grain processing, grain barns and the "first farmers" in an earlier blog. Many of the neolithic rectangular timber buildings in Britain and Ireland were situated beside or close to streams and rivers. Carbonised barley grains with missing embryos have been discovered at a number of these ancient sites. I think that they are good candidates for grain barns and malt houses five thousand years ago. The steeped grain is transferred to the malting, or germination, floor. This is where it begins to grow visibly. Conditions have to be right. It's too hot in the summer months for floor malting, however, with the modern GKV systems it's now possible to make malt every day of the year. At an industrial floor maltings there are large amounts of grain to be carefully transferred from one place to another. We were introduced to the malt chariot. According to Distillery Manager Marie Stanton, a malt chariot is a tricky thing to learn how to drive. The maltsters are experts at it, of course. 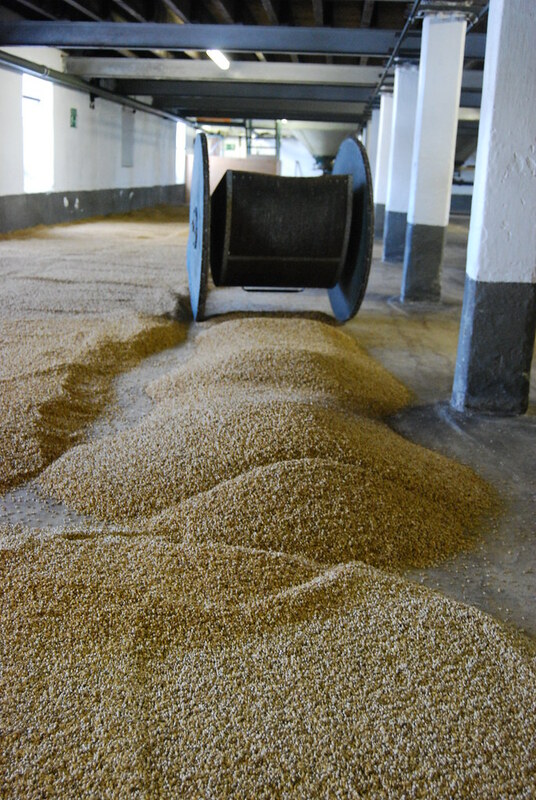 An industrial floor maltings has to deal with large amounts of malt which is couched, then spread out on the floor. The chariot at Highland Park was in use regularly for this purpose. Ambient temperature and weather conditions dictate the depth of the grain bed. 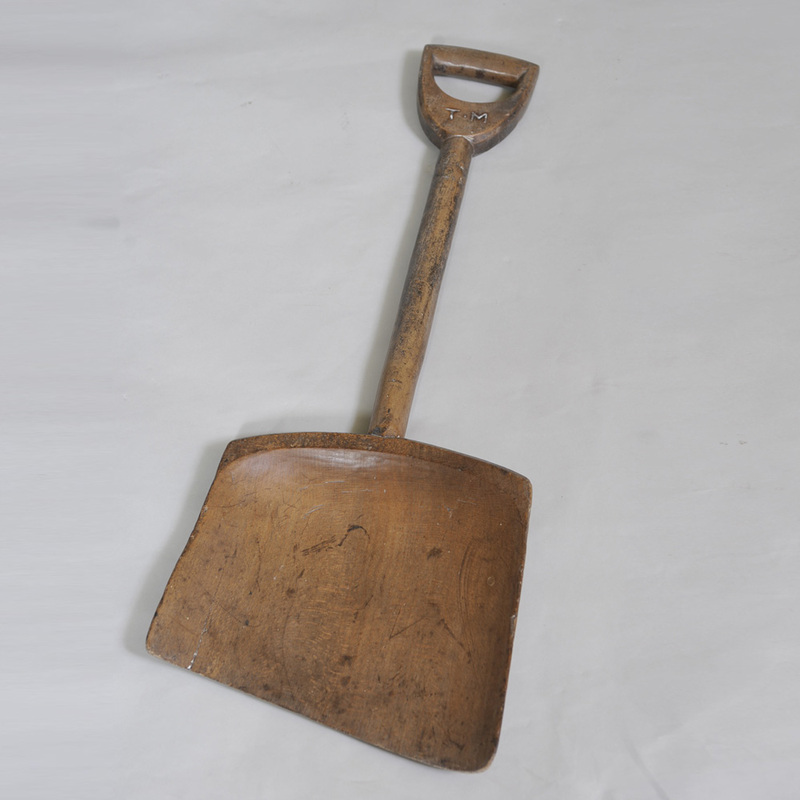 There were several wooden malt shovels, or shiels, leaning up against the wall. They are used to turn the malt. It's a long job and in an industrial maltings like this, team work is crucial. It takes hard work and skill to turn tons of malt on the floor using one of these. On the tour we were told that some maltsters at the Highland Park were ambidextrous, able to turn malt to the right and to the left with ease. Others preferred to just work one way, which seems to be how the owner of this well worn malt shovel worked. As well as wooden malt shovels, fish tail rakes are used. These make the job so much easier, follow the link below the photo to find out why. Raking the malt is not just a skill, it's an art. How did neolithic and bronze age maltsters turn their malt? What did they use? They had no metal rakes. Wooden tools rarely survive in the archaeological record. I've sometimes thought that an animal's shoulder blade might have been a suitable tool. A scapula is a sturdy thing, it has the shape of a shovel and could be used for many tasks that the "first farmers" needed to do. It would do the job of turning the malt nicely. Has anything been found that might support this idea? There's only one discovery that I know of. During road works in 1987 at Achavanich in Scotland, a female cist burial dated to the Bronze Age was discovered. It had contained the crouched burial of a young woman, however only the skull and a few bones remained. "The contents of the beaker were analysed by Dr Brian Moffat of SHARP who, from a preliminary examination, suggested that it contained: prepared cereal grain, honey, added flowers and fruit (including meadowsweet, bramble & wood sage), and the sap of birch and alder trees." Similar residues have been found in other bronze age pots and have been identified as the remains of ale. These two things combined, the pot with cereal based residues and an ox shoulder blade, suggest to me that the woman may have been a maker of malt and ale. She had been buried with the necessary equipment. I mentioned this to a couple of people on the tour and they agreed it could be a possibility. The young woman who was buried 3700 years ago is now the subject of a new investigation by archaeologist Dr Maya Hoole. The details are here if you are interested. 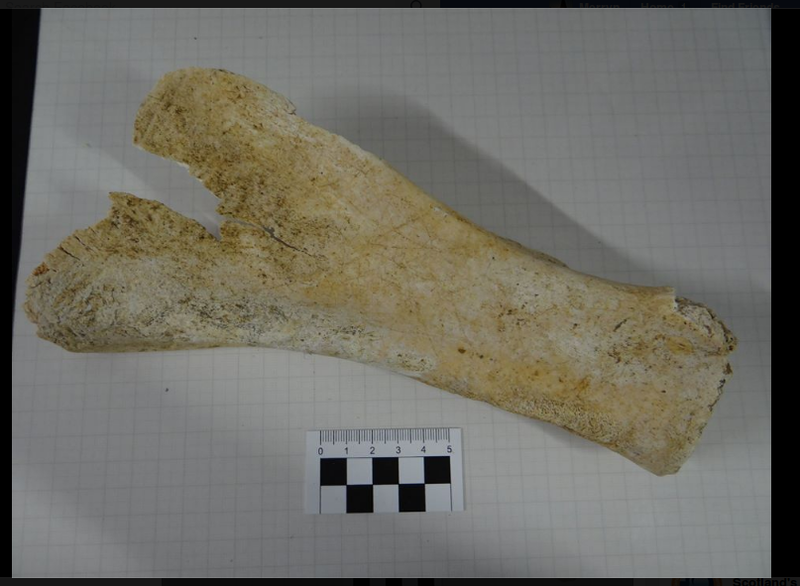 ox shoulder blade from the Achavanich burial, was it used to turn the malt? The next part of the tour took us to a small room, the laboratory, where the viability of grain for germination was assessed. Why does it need to be tested before it is steeped and turned out on the malting floor? Because barley has a latent dormancy after harvest. It must be stored, in a dry place, for a few weeks or months before it will germinate. The reasons for this and the biochemistry behind it are not yet fully understood. The length of dormancy can vary between crops and barley variety. Traditionally, grain has always been left for a while after harvest. People have known about latent dormancy for a long time. Grain that will not germinate is useless to a maltster. Upon delivery, samples are taken from every batch of grain. Individual grains are selected at random and tested for viability. This can be done by steeping them in a solution of hydrogen peroxide at 0.75% at 18-21 degrees Centigrade. Germinated corns (seeds) are counted after three days. For a working maltings, this takes too long. A quicker method of checking viability is to cut a grain longitudinally and use tetrazolium chloride which stains the embryo pink. The maltster can get a result in half an hour. There was a very nice little grain cutting machine in the laboratory at Highland Park, used to cut grains in half for testing from every batch of barley. Shame I forgot my camera, but here's a picture of a stained living barley grain from the MAGB website. Pink toed barley, that's what the maltsters call it, if the barley has a pink toe then it's good for making malt. white endosperm, pink embryo, it's alive! The final part of the tour was to climb the old narrow wooden staircase, it was more like a boxed in ladder, to look at the kilning floors in the loft. We were treading in the footsteps of maltsters past, it was a strange feeling. The steps were worn, malt has been dried here, in the same way, for two hundred years. We looked through the window to see the green malt, steaming as it began to dry. It looked very much like the photo below. Drying malt on this scale takes three or four days. The maltsters turn it at regular intervals so that it dries evenly. Hot air and peat smoke from the fire downstairs passes along the flue and through the bed of wet malt, imparting flavour, drying it gently so that the malt is not killed. We left the kilning floors by a small door which led us onto a metal walkway on the roof, right beside the distinctive pagodas. Whenever the malt is being dried there is steam coming from the pagodas. We had great view over Kirkwall and a new perspective of the Distillery, a place that we often drive past. Finally, we went down the metal staircase on the outside of the building to see the kiln fire downstairs. The maltsters start the fire with coke to warm the kiln, after this, peat from Hobbister is used. The peaty smoke flavours the wet malt. Coke is used at the end to thoroughly dry the malt. Each fire needs to be run slightly differently, depending upon the batch of malt. It's just another of those maltster's skills that can only be learned by experience and practice. This kiln has a fierce fire but is situated a long way from the malt. In a pot kiln, you need great heat to fire the pots. The principle with a grain or malt drying kiln is completely different. Hot air and smoke pass along the flue and through the bed of green malt. There are sturdy metal linings to contain the sparks and make it safe. I don't want to go into any more whisky making details. My interest is in making malt for brewing ale and beer. Today there are many different kinds of malt being made by maltsters for brewers. It can be confusing for a non brewer. The most crucial is the base malt, the one that is made and dried like this, carefully and slowly to keep the starch converting enzymes alive. These enzymes are needed in the mash tun. Base malt provides all the necessary sugars for fermentation. Other malts, such as crystal malt or chocolate malt have only been made since the mid 18th Century. Just to confuse the issue even further, there is also roasted barley, which is not malted at all and which gives dark beers like Guinness and porter their distinctive black colour and flavour. Hops add bitterness and other flavours, they are also antimicrobial. Unroasted barley alone cannot be used to make beer, it is added to the base malt. Unroasted barley has no enzymes. Specialist malts provide colour and flavour to the finished ale or beer. They are a modern thing; making roasted malt is not a prehistoric technology. Specialist malts are roasted at high temperatures that kill all the enzymes, therefore it is not possible to make beer using only this kind of malt. I shall have to write something later about this, it's a huge subject. Malt is a mysterious thing to most people. In the world of archaeological and anthropological literature I find few references to malt. There is very little meaningful discussion of it. Assumptions have been made that malt is "toasted roasted barley sprouts". Another belief is that the archaeologist has to actually find "sprouted barley" with roots and shoot still intact for there to have been malting and brewing at their site. I have been told this many times by archaeobotanists. The reality is that the malt loses its' roots and shoots in the kiln. An archaeologist will not find them. There are many other indications that grain has been malted. When you read the academic archaeological and anthropological literature about "alcohol production in prehistory", there is a belief, an assumption, that all you have to do is mush up a few sweet things, like berries, honey, some sort of sweet plant, maybe a bit of barley and some birch sap. Leave it in a bucket or a pot and, magically, you will have "some sort of alcohol". Making ale and beer is not like that at all. Malt is the essential ingredient. It provides both flavour and, more importantly, the necessary fermentable sugars without which there will be no ale. No beer. That's more than enough for now. I shall continue working on my post about alcohol production and some of the myths that surround it in the archaeological and anthropological literature. I look forward to comments and discussion with about malt in the future. Malt matters. Here's a bit more that I've written about malt, malting, the history and the archaeology. I shall get around to tagging the blogs soon so they are easier to navigate. Who were the first maltsters? The archaeological evidence for floor malting. where have all the malting floors gone? Making malt involves a huge amount of knowledge, skill and experience. This is the second part of my write up of an Orkney Science Festival event that I was fortunate to attend. Making Malt took place on the morning of 7th September at the Highland Park Distillery, Kirkwall. If you haven't read part one, see here. There were twelve tickets available. Malt, malting and the history of the craft is something that I'm particularly interested in, so I bought two tickets on the first day that they were available. Well worth it. The second presentation of the morning, by Distillery Manager Marie Stanton, was about the practice and techniques of floor malting. She gave us a fascinating insight into the craft. To make good malt, she said, you need good quality barley as well as common sense, experience, commitment and an unnatural obsession with the weather. The first four things seem obvious but, the weather? What's that got to do with making malt? Malt is a living thing, it requires careful handling and processing. The maltster needs to be very much aware of the weather, looking after the barley on the floor as it begins to germinate and adjusting things accordingly. In cold weather, the barley is couched, or heaped up deeper on the floor. In warm weather, such as the day the seminar was held, they had been raking it out thinner, to cool it. The grain generates heat as it germinates on the floor. This is the ancient craft of floor malting, a craft that has been around for thousands of years. Decisions about length of steep, depth of bed and readiness for the kiln are based upon years of experience, knowledge and skill. The steep is about more than just getting the barley wet before it goes onto the germination floor. Water temperature is important, as well as several air rests. Grain left in water will drown and be no good for germination. The idea is to rehydrate the harvested and stored grain up to about 45% moisture. When sufficiently steeped, the grain is couched, spread, turned and raked regularly according to temperature and conditions. It begins to germinate. This might sound straightforward, but there's more to it than you might think. I'll write about this in the next blog, the tour of the Maltings. When we were visiting, malt was drying in the kiln but there was none on the floors. The presentation on Making Malt continued. Bowls of barley were passed round. One contained freshly steeped barley. It had the aroma of wet grain, as you might expect. Another contained barley that had been on the floor and had begun to germinate. This had a pleasant, fresh, almost floral aroma which is hard to describe. The two bowls had very different aromas, although they were just a couple of days' processing apart. This was something I did not expect, these aromas of germinating barley. There is some complex chemistry going on inside the grain as it begins to germinate. If you want to know more about the biochemistry and physiology of grain germination, there's a reading list at the end of the blog. The purpose of germination is to allow the embryo to grow, just a little. Enzymes develop and begin to degrade the beta glutens, proteins and cell walls. This is known as modification. When the grain (green malt) is sufficiently modified, it's ready for the kiln. The malt is dried slowly and gently, to preserve the enzymes. They will be needed in the mash tun. Although there is a fierce fire, the malt is not put directly above it. Hot air and smoke from the fire needs to pass along the flue and through the bed of malted grain, drying it gently over several days. The malt steams as it dries. Both peat and coke are used as fuel. The wet malt takes on flavour from the peat smoke. It's turned regularly in the kiln, to ensure an even drying process. The maltster does not want the malt to be too dry, does not want roots, but they do want plenty of enzymes. It's important to know your kiln, we were told. Each one is different and the drying of the green malt from the floor is a matter of great skill, experience and knowledge. After kilning, the malt needs to rest for a few weeks before it is used. There was some discussion in the room about why this should be and why it affects the flavour. It seems that the complex chemical processes of this resting period are still not understood. There was general agreement that rested and unrested malt should not be mixed together. At the end of the presentation, a bowl of the finished malt was passed round. We were told that we could have a taste. It was delicious, each malted grain imbued with a peaty, smoky aroma, very good indeed. Next, the tour of the maltings. We saw bubbling steep tanks, malt chariots and shiels. 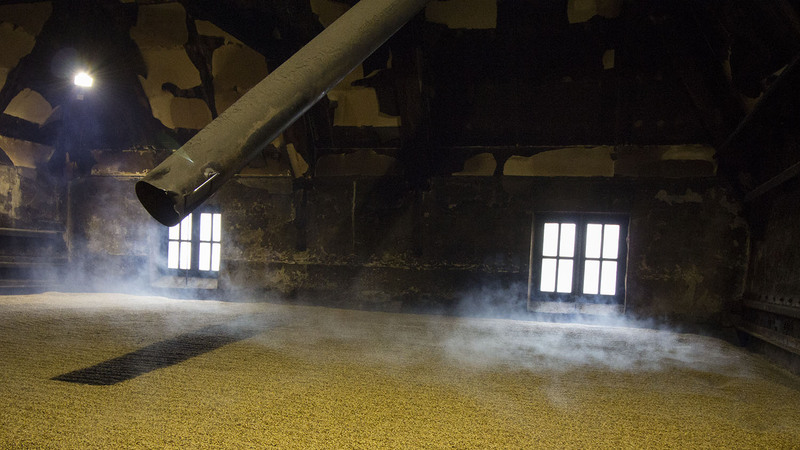 We saw the malt, steaming in the kilns. As we went in I realised I'd forgotten my camera. I made notes, not just about what we saw on the tour, but also some thoughts on origins of this ancient craft and the potential archaeological evidence for it. After completing my Master's in 1999, I tried to get funding for a PhD looking into the history and prehistory of malting and the archaeological evidence for malt. I didn't get any funding, but I did get to spend several years preparing funding applications. I worked with brewing scientists and therefore I had access to their library at UMIST, Manchester, where I read up on malting and brewing science, grain germination physiology. I can't say that I understand it all but I learned a lot. This is what maltsters call “the bible”. There is a second volume on hopped wort and beer. The Orkney Science Festival is held annually. It's always a great week of varied and interesting events, talks, demonstrations and fun. This year there was a Malt and Malting seminar with a special tour of the Maltings at the Highland Park Distillery, Kirkwall. There were only a dozen places available and we were lucky to get tickets. We spent a fascinating morning with malting, brewing and distilling experts. It was all about the malt. Making the malt for brewing and distilling is exactly the same process. The difference in processing techniques happens after the mash tun. A brewer takes the sweet liquid from the mash tun, calls it "wort" and adds hops or herbs, then ferments it into beer or ale. The distiller takes the sweet liquid, calls it "the wash" ferments it into alcohol and then distils it. The wort and the wash are two names for the same thing, the sweet liquid that is obtained from the mash tun. Every brewer who makes ale or beer from the grain knows what wort is because they work with it. People who have never made an ale or beer from the grain are perhaps a bit confused about what it is. Depends if you are a brewer or distiller. Dr Tim Dolan gave the first talk of the morning, explaining the fundamental aspects of what malt is, the biochemistry of malt, how it is made and a little of the history and development of the industry. His career in the malting and distilling industry goes back 40 years and he now teaches the subject. The other speakers were Marie Stanton, Distillery Manager of the Highland Park. She shared her knowledge of floor malting, then led us on a wonderful tour around the Maltings. The third speaker was Eric Walker, recently retired, a man with a distinguished background in all aspects of the malting, brewing and distilling industries. He talked to us about the prehistory and history of making malt and explained some technical details. They were quite a team and between them they had a huge amount of knowledge and experience of making malt. In previous years there have been talks about brewing and distillation, usually organised by the Institute of Brewing and Distilling. Tim told us that he thought it was about time there was a Science Festival event about malt, the Cinderella subject, because malt is the crucial ingredient for ale, beer and whisky. What is malt? 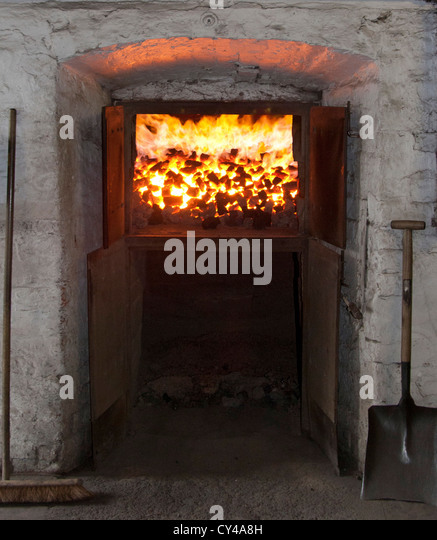 It is grain that has been germinated under controlled conditions, then dried carefully in a kiln. Making malt has been a skill, an art and a craft for a very long time. Over the years I have given a few talks at the Science Festival. I was pleased that Tim remembered me and had been to my presentations on malting in prehistory, neolithic ale, grain barns and my most recent "Where were the Viking Brew Houses?" a couple of years ago. The advent of the combine harvester in the 1940s transformed the grain harvest. The ancient and traditional way of harvesting grain by hand was extremely hard work, it was a time when the whole community worked together to bring the harvest home. On Orkney, where I live, grain was harvested by hand and stacked in stooks in the field until as recently as the 1950s. In case you don't know what a stook is, I looked online and found this painting by British artist Heywood Hardy (1843-1933). Painted in 1872, it depicts a typical scene of the time. I like the detail of the stook and you can see how they were made. The effort and hard work involved in making them can only be imagined. This oil painting was done just a few years before Henry Stopes published his book about Malt and Malting, an Historical Scientific and Practical Treatise in 1885. It is now available to read online. Oxford University took the trouble to scan it in, many thanks to them for that. I first read it when I borrowed a copy from a brewing scientist when I began my research. It's such an important book and it is an excellent snapshot of the malting industry in the late 19th Century. Henry Stopes mentions the work of Louis Pasteur, who had recently published his work on Germ Theory which was to make such a huge impact on the brewing industry. But I digress. Let's get back to the talk about malting. Tim explained the biochemical processes of germination, with the embryo being the living part of the grain and the endosperm being the starchy food store. Malt, he said, is a living thing. It must be handled and processed carefully and correctly by the maltster. This was a point that was made several times throughout the morning. First, the harvested grain is steeped in water. It's crucial to allow air rests. The steep tank is drained of water at regular intervals. If the grain is left in water without air rests it will drown and this means that it will not begin to germinate. Thanks to scientific research into grain germination physiology and biochemistry which began in the 1960s, we now know that when grain is sufficiently wet and aerated, gibberellic acid is released from the embryo and the aleurone cells. This stimulates enzymes which convert the grain starch into sugars, the food source for the plant. All grains can be malted. Barley is considered to be the best grain for malting but wheat, rye and oats can also be malted. Here's a useful diagram of the internal structure of a malted barley grain. The craft and skill of the maltster lies in getting the grain to start growing, but not too much. This is known as modification and there is some excellent and detailed information about what malt is and how malt is made on the Maltster's Association of Great Britain web site. The Highland Park has three traditional malting floors where the grain is spread out after steeping. Raking and turning the malt is a crucial part of the process. We were told that this helps to maintain an even temperature and it also prevents rootlets from tangling. On the malting floor the barley begins to germinate. When the maltster sees the root and shoot being about four fifths the length of the grain, it is sufficiently modified and ready to be carefully and gently dried in the kiln. Modern techniques of making malt involve the use of Saladin boxes and drums. There are also huge germinating kilning vessels which can make three to five hundred tons of malt at a time. All year round. The quality of the malt can be controlled because it is easy to maintain precise temperatures and levels of moisture. The third speaker of the day, Eric Walker, gave an interesting talk about the industrialisation of malting and I'll write that up later. In the meantime, here's something I wrote about where the malting floors have gone. "The most famous name in local malting was that of Dr. Ernest Sloper Beaven, and his reputation is international. He was born in 1857 to a Heytesbury farming family, who moved to Boreham Farm at Warminster in 1868. Beaven said that he began to observe barley closely from 1878 and he became associated with Frank Morgan, Warminster’s leading Maltster. Beaven’s first experiments had been with onions and potatoes but from 1900 he was growing, selecting and crossing barley from seven initial different ‘races’. In 1904 he acquired fields on the Boreham Road for a nursery and in 1914 he launched ‘Beaven’s Plumage Archer’ strain of barley and continued with seed trials for the next 27 years. Beaven could claim that 85% of the total U.K. acreage of barley was grown from the progeny of just four plants, three of which had been selected in the nursery at Warminster between 1900 and 1904." In the last one hundred years or so, much has been learned about barley and the biochemistry of germination, however, there is still much to be learned. Although some of the mystery and magic of malting has been studied and explained by scientists, some things about barley are little understood. One of these is latent dormancy. Someone in the group asked about this and the answer was that it is still a bit of a mystery. There is a practical tradition of leaving the grain for a while between harvest and steep, because it will not germinate. This could be about variety, or it could be seasonal. The best thing I can suggest, if you are interested in finding out more about latent dormancy, is to search for the academic and scholarly papers on it. There are quite a few of them out there. The next talk was about the skills, techniques and practicalities of floor malting and the turn of Marie Stanton, Distillery Manager, an experienced maltster at a number of distilleries. And then there was the tour of the Maltings. There is only so much detail that one blog post can take, so I shall leave you with a picture of the maltsters hard at work at Highland Park Distillery. I forgot to take my camera to the seminar, but I did take plenty of notes, so I hope this will suffice while I get down to writing part two, while it is fresh in my memory. maltsters, turning the malt at the Highland Park Distillery with shovels, or shiels.